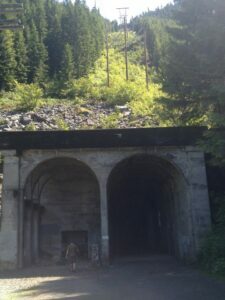 Horse State Park “Tunnel of Terror,” Snoqualmie Pass, just east of Seattle. This time of year, hiking and Halloween are two of my favorite past times. If you’re the type of person who enjoys a good scare along with your outdoor recreation, have I got an adventure for you! Pack your hiking gear and some ghost stories for the 45-minute drive from Seattle to Snoqualmie Pass along Interstate-90. At the pass, take exit 54 and proceed south to Iron Horse State Park. At the trailhead bundle-up with some warm layers and grab a flashlight or headlamp. You’ll need them because it’s VERY cold and VERY dark where you are headed. Once you’re geared-up, hit the John Wayne Trail, which is an old train track, and head west a short distance to the large stone arch entrance. Here, enter (if you dare) the 2.3-mile, old tunnel and see what your imagination can stir up. As you walk toward the pin of light on the far end you’ll notice the light from behind you begin to diminish. Soon you’ll find yourself in the darkest of dark. The light you brought will only provide minimal comfort as the air it penetrates is wet and thick with fog. From time to time you’ll be startled by the drips of ice cold water that hit you from above. If you find that you’ve made it all the way through, don’t rest easy because you still have to go back the same way you came – and we all know what happens to the cocky kid in the scary movies. That is, unless, you rode your bike and have someone to pick you up 22 miles down the trail at Rattlesnake Lake.